Always had the grouse that your favorite device, the iPad, was not compatible with Flash? After all, 90 percent of the web video is still Flash dependent and you firmly believed it was silly on part of Apple to not to have included Flash support in the iPad. But not any more! 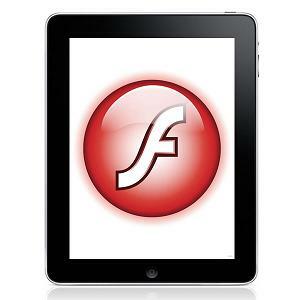 For you, dear reader, are just 3 steps away from enjoying your favorite Flash videos on the iPad. And the 3 simple steps will take just as many minutes to get the job done. But before you start, spare a moment to extend your gratitude to the good folks at Benm.at who have taken all the pains to create a single Cydia package so that you don’t have to go through a complex downloading process. 1. The first thing you need to do is to open ‘Cydia’. Then navigate your way through ‘Manage’ and reach ‘Sources’. 3. In the last step, you will have to go to ‘Search,’ type ‘Frash’ in the search box and tap on install. And there you are. Flash content will play back on Safari in all its glory. However, the above process may not be applicable to the 3G enabled iPads due to hardware incompatibility.